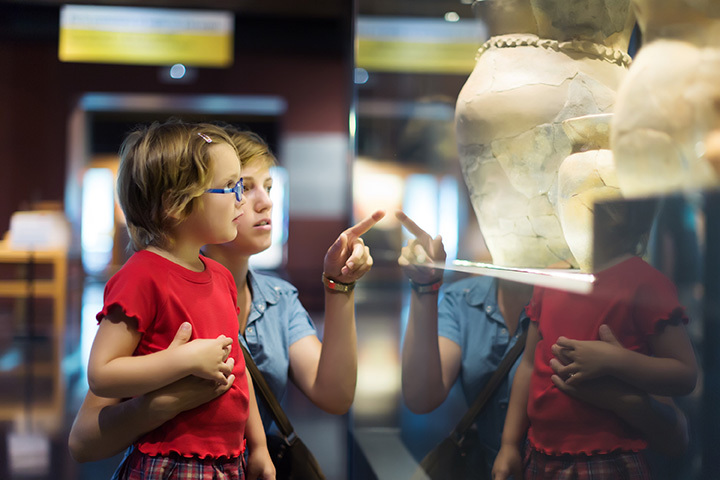 From museums illustrating the history of local railways, to contemporary art spaces, to museums designed for giving children hands-on opportunities, South Carolina has something to please everyone. Museums offer more than lessons on life way back when, they offer experiences you won’t forget. Here are the 10 best museums in South Carolina offering unique insight on the state’s history, and so much more. While plenty of bold “Do Not Touch” signs litter every exhibit in other museums, the Children’s Museum of the Upstate in downtown Greenville insists interaction at every turn. Fun and education collide in three levels of learning. From toddler-friendly play areas to Grandma Betty’s Farm to the one-of-a-kind climbing structure, kids of all ages will thrive on hands-on opportunities and unique experiences… and beg you to let them stay. All aboard! This museum is on the move! Chugging along five miles of track, the visitors can take a ride through history on the real Rockton and Rion Railway from the 1880s. Formerly used to haul blue granite from quarries in South Carolina, the multicar train is now known as the Rockton, Rion and Western Railway. Hop aboard for a Saturday excursion June through August, or take a tour on one of their special events. There are also several stationary cars lining the museum headquarters for train enthusiasts to explore, such as a mail car, sleeper car, and steam locomotive. All cars featured at the museum were once productive vehicles, working hard to further American civilization. South Carolina’s low country offers some of the greatest sights of the south, and you can experience them up close at Coastal Discovery Museum. Numerous trails and gardens wind through 68 acres of natural history and local culture. You’ll also find a butterfly enclosure, wildlife, costume play, scavenger hunts, and excursions for both land and water. Aside from the architecturally amazing building, the BMW Zentrum Museum displays all the fine details of the ultimate driving machine. From BMW’s rich history, to the successes of their innovations, to real versions of retired designs lining the floor, you can quench your thirst for all things speedy. Detailed exhibits that delight the eyes of young and old line the numerous walls within Anderson County Museum. Decadent in local history and heritage, Anderson has carved its own place in history, and the museum tells its tales like no other. A miniature model of the Anderson County fair, the South Carolina Heritage Corridor, and the importance of electricity and textiles to the local economy are only some of the many adventures that visitors will journey through. If you’ve ever wondered how they handled hot disasters way back when, the North Charleston Fire Museum can quench your queries. Guests get a glimpse of what it’s like to be a real firefighting hero: you’ll get hands on with hoses and gears, and learn how much firefighting has changed through the decades. With interactive exhibits and theatrical presentations, you can get as close to firefighting as possible without compromising your safety. Formerly two separate entities until the Adams family donated the railroad collection to the museum, both attractions serve as Greenwood’s epicenter of arts, culture and history. Take a stroll through Greenwood’s history, explore the wonders of caves, mining, and minerals, and follow the epic journeys of North American and African wildlife. Special events include family nights at the museum (bring a flashlight! ), dinner on the authentic Erie-Lackawanna dining car, Museum Book Club, National Train Day, and more. No matter if your ancestors fought for the Yanks or the heart of Dixieland, civil war buffs from both sides can appreciate the history lessons this museum brings to life. The large range of well-preserved weaponry, attire, and other recovered artifacts serves as a good reminder to be thankful for the modern conveniences and freedoms we enjoy today. Not so surprisingly, this museum also doubles as a shooting range, but don’t plan on shooting any of the civil war artillery that’s behind the glass (no “blasts from the past” here). There’s nothing like acknowledging your hometown heroes, and South Carolina has taken strides to make sure those heroes get the solid recognition they deserve. That’s why they’ve created an entire museum to those who have made extraordinary contributions to the state. From slaves to artists to past political figures and more, this museum displays the strong culture locals know as South Carolina pride. Calling all art lovers! It’s certainly not the Louvre, but the Halsey Institute of Contemporary Art boasts some innovative collections from artists near and far. Located at the College of Charleston School of the Arts, you may never see the same exhibit twice since they are continually updating their displays for your enjoyment.